The daily report on your buyers shows you how many buyers have enquired for the month, which salespeople are working with the buyers, also inspections that were done yesterday and how many inspections have been done for the month. It also shows you the break up of all the enquiries you have had within the month relating to any advertising you are currently doing. Your daily report from the whiteboard shows all calls that have been made to vendors, any properties that were listed, sold or signs placed on properties. The report on the prospects database shows how many clients each individual Salesperson or PA is currently managing, how many new contacts were added and how many were updated from previous records. It also has a section which shows us how many they feel are selling under the next 45 days. Every seven days we also get an automatic email sent to the owner of the business showing the dollar value of any sales that are pending. Properties that are conditionally exchanged and a dollar value on those properties that have been exchanged unconditionally but have not settled yet, to allow us to have an idea of our cash flow situation. With individual Salespeople we are able to do 'One on Ones' - results performance meetings. iWON gives us the results performance of each salesperson at a push of a button. See the recorded actvity for each month or quarter (the number of listings a person has made, price changes organised, how many sales they are involved in or unconditional contracts they have made). This gives an overview of the current results level in the agency for the current month on any day. This view also includes the monthly performance of individual sales people. The results automatically update as new listings or sales are added to the system directly by the sales agents or admin staff in real time. Under 'Today's Results' (on the top left) we can see that results have occurred on the day. Most operations are carried out within a 4-click operation with minimum typing required through out the system. The types of results that are displayed are; listings achieved, sales started, unconditional contracts, or a signboard placed on a property. 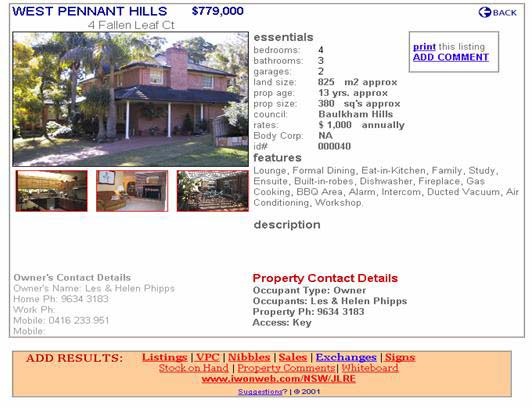 Offers, which is in the centre of the Whiteboard shows a list of properties a salesperson has an interested buyer in. This allows the entire office to be aware of which property maybe about to sell. Pending Sales are those properties where a sale has started but the transaction is not unconditional. Top 10, a place where you are able to list properties that need special attention or are the best priced listings. Monthly Targets for each sales person can be adjusted at any stage. Numbers in GREEN represent results achieved for the month, while numbers in RED represent the target level the sales person has forecasted to reach for that month. The whiteboard layout as shown above can reduce down for a single operator or expand for up to 12 sales people in its current layout. As sales people are added or withdrawn from the system, the whiteboard automatically changes the office totals as required. To navigate in this part of the system click on the word linebar located at the top and bottom of the WhiteBoard. · LISTINGS; click here to add a new listing into the system. · VPC (Vendor Price Change); click here to adjust the price on a listed property. · OFFERS; click here to place an offer or indicate you have an interested buyer in a property. · SALES; click here to enter a new sale on a listed property. · UNCONDITIONALS; click here to transfer a property from pending sales to unconditional, pending settlement. · SIGNBOARDS; click here to adjust the signage status of listed properties. · SOH (Stock on Hand); click here to view current stock or history of sale prices. · PropCom; click here to enter comments onto a property record. · Clients; click here to view your current (only see those listed under your name listed properties) history and comment files. The other words at the end of the top line of links takes you to the other major parts within this system. · Futures; click here and enter the prospects database. · BTS (Buyer Tracking System); click here and enter the buyers system. · Diary; click here to view and work the interactive online diary. · Referrals; click here to find an agency in Australia or New Zealand. This is where it all comes together, a working platform for the sales team, support staff and PA's. With access to each major part of the iWON system in a straight forward interactive on line diary, with individual access and office overviews. Sales Managers now have the ability to keep track of where the agents are, book meetings, floor time, days off and much more. In the prospects database referred to as 'Futures' we enter, monitor, record while working with a property owner until they place their property on the market. In this database you are able to keep track of; general comments, mail outs, property features, selling time period as well as follow up dates. With the ability to send text messages, emails or printed letters to any owner or group of owners. These can be entered in under a salesperson or PA's name or as an office contact. One person or several individuals can handle the day-to-day management of these clients. The company can at any stage transfer a client base from one salesperson to another in the event of a person leaving while at the same time sending an email or text message to each person in the database informing them of the change or simply sending a Christmas / New Year's Day greeting. On the home page of the Futures section each day you are given a list of people to call, with those not called moving to the overdue section the next day. Like most decent databases we can split data into selling periods so we can also see what sort of period range they wish to sell in, whether less than 1 month, 3 months or over 12. With the one office individualised database management system we can prevent salespeople contacting the same client. While each salesperson can only see their clients, the office is able to look at any record. All information / data can be viewed by the sales manager; while each salesperson's data and vendor records are only viewable by that salesperson. Control without interference, until the time is needed. As the name implies it gathers and tracks all information on any buyers who enquired about purchasing a property from our office. Starting with their name, phone number and the property they enquired on, then onto all properties driven by, inspected and any they have made an offer on. All general and property inspection comments are also recorded. All property comments recorded on the buyer's card are automatically recorded at the same input time on the properties vendor history card. Thereby allowing the listing agent to stay informed of any inspection other agents have made without the need of personal contact. Also any time any comment is entered on a property in the system the listing agent is automatically sent a copy of the text that was entered via email. BTS matches properties to buyers and buyers to properties, and in the near future buyers to properties that are in our prospects database who are thinking of selling in the next few months. Open Buyers - These are new people who have enquired about a property and no salesperson is currently working with them. Active Buyers - These are buyers a salesperson in your team is currently working with. They may fall under four sub levels; the general enquiry who is unable to be helped at the present time due to current stock type or pricing, those who are driving by properties, those who have inspected a property and those who are negotiating on a property. The Buyers Pool - Those people that your salespeople have worked with for a period without making a sale and now have no other stock to show these people at present. Or when an offer is pending on a property and we want to give all people who may be interested in the property one last chance to make an offer before the vendors accept the pending offer. With the information recorded from each enquiry we are able to monitor our marketing and record what publications are attracting buyer activity and what listings are generating calls. Once a property is listed and placed in the system our display system will upload the images and text to the web pages automatically. Photo's loaded into iWON are reflected on your other private web sites. Add or change text in one location with live editing. The page is able to be printed or emailed without the contact details being revealed. iWON also has the capability to send out a weekly or monthly property stack list with pic. To all buyers who have supplied their email addresses. Just another way to make business with your agency, informative and easy. When listings or sales are entered an auto generated email is sent to the administration person informing them to start any paper work that is required. When new listings go on the market all salespeople are notified via email with the property description and link to web display page. When a new property is placed on the market your office support person is sent an email to put up a For Sale sign on the property. Then when the property is sold to place a sticker on the signboard and at settlement to pick up the signboard. When any comment is added into the system on a listed property the listing agent is sent a copy of that comment via email. 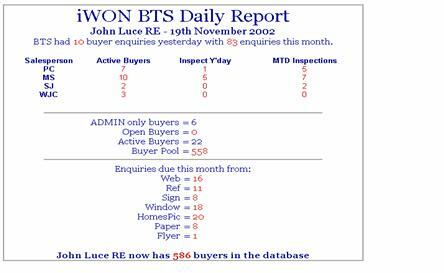 Daily the Sales Manager / Principal is set an email report on; Buyer activity through out the office, work performed in the prospects database and the activity report from the previous days whiteboard results. Simplicity and flexibility with control and the freedom to work when where and how you like. A system designed for a salesperson or business owner to operate while doing no more than their daily activity!